It is surprising how many law firms, their leaders and partners eschew the discipline of planning and strategy. Many firms still don’t require annual plans or even the process of planning from their partners, or practice groups and many don’t even have a strategic plan for the firm. 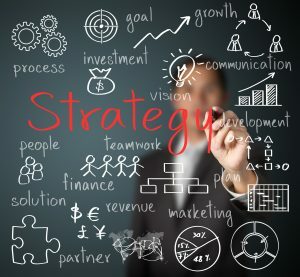 A survey conducted by Patrick McKenna and David Parnell last year called Law Firm Strategic Planning and Deployment: A Report on the State of the Art found that while the majority of firms in their survey reported engaging in strategic planning, most written plans that resulted were brief and targeted just a few priorities. They also were more internally focused than externally market-driven. Many firms still do not have a written strategic plan and those that do don’t regularly update it or execute on it in measurable ways. In what other industry would businesses, some with revenues exceeding $2 billion, be able to operate, get funded, obtain insurance, satisfy shareholders and stakeholders without a comprehensive written plan?! Law firm partners and even leaders often believe that doing plans is a waste of time, because things happen quickly and change constantly. They might even share stories of how their best client or new area of expertise was developed serendipitously and opportunistically. Some firms jump right into developing a plan without doing any assessment of recent success and failure, impediments and threats, trends and opportunities, and perhaps most importantly soliciting input from clients on their future needs and perceptions of how your firm could or could not help satisfy those. It is essential to collect important information and context before settling on goals and strategies. Core capabilities analysis: current technical knowledge/skill sets, range/depth of services and experience, technical expertise and experience gaps in segments, gaps in skills or staffing. Innovation and service delivery: project management, process improvement, staffing models, efficiencies, tracking of metrics, knowledge repositories, and the use of automation/technology and allied service providers, new products. Practice management analysis: internal organization and policies, work assignment and staffing, training and supervision, knowledge management and technology, quality control, new matter/client intake, team collaboration. Client relationships, satisfaction and expansion: relationship history, relationship matrix, three-year revenue trends of practice group for top 50 PG clients, share of clients’ legal spend, exported revenue (clients/matters sent to other PGs of the firm,) revenue by clusters (industry, geographic, issue/subspecialty,) lost or dissatisfied clients, client feedback and retention, cross-selling and co-marketing involvement with other PGs or interdisciplinary teams. Marketing and business development effectiveness: sources of business, prospect pipeline tracking, RFP and pitch process, referral sources, successes/failures, branding/positioning, industry and business conferences, events and sponsorships, entertainment, support, strengths and weaknesses and ROI. Cross-practice opportunities: other PGs that routinely refer work, industry groups, cross-specialty practice services and opportunities. Talent and succession: Hiring including lateral hiring and integration, retention, training and development, work assignment and oversight, diversity, retention, employee engagement, succession and retirement. Practice group governance and management: Leadership effectiveness (360 reviews,) communication and engagement, conflict resolution, new client intake and conflicts and quality control. Practice group member input: A survey and interviews/focus groups to gather input on threats, opportunities, strengths and weaknesses of PG. In the survey referenced above that Patrick McKenna and David Parnell conducted, they reported that most firms’ plans had an internal focus more than an external focus and many firms are not conducting any kind of external market research to identify and test concepts for new services, new markets and differentiation. Following trends and market developments and tracking competitors is vital to designing and executing successful plans. Market and trend analysis: service demand trends, geographic markets, client industries and segments, economic, Political, social and demographic, legislative and regulatory trends, market and industry opportunities and threats, technology trends. Client needs and market perception analysis: surveys and interviews with clients and other business leaders, trends reports by Big 4 and management consulting firms, client and prospect needs, preferences and purchasing behaviors including whether legal spend is growing or shrinking and percentage of client legal spend the practice group gets now. Competitive analysis: key competitors practice group regularly encounters in cases, deals, client pitches and conference sponsorships, including alternative legal service providers and technology platforms, market share and growth, perceived image and performance, current positioning, pricing and marketing strategies. Opportunity analysis: new products/services, new markets, new legislation/regulation/case law, niches. Once the data collection, research and analysis have been completed, the summary should be shared at a minimum with all partners in the practice group, and ideally with associates and other professionals in the PG. The practice group (or a representative subgroup) should meet to discuss the full findings. The SWOT summarizes the Strengths (internal, firm focused,) Weaknesses (internal, firm focused,) Opportunities (external, market-focused) and Threats (external, market-focused) in an easily digestible box format. The group may want to (re)define it’s “ideal client,” “ideal services,” and “ideal industries/markets” profiles based on the top clients, profitability assessment, market trends and opportunities and service strengths. Once that is discussed, the next step is to craft a Vision Statement for the practice group — this in aspirational, inspirational and achievable summary of the PGs view of itself in the future and outcomes and benefits it strives for. After the vision, the group must determine measurable goals for the practice group for the next year. These goals will be what drives the action plan that is then developed and usually include financial, practice, client development and marketing goals. In many firms, practice group leaders draft the practice group plan, usually but not always with some input from a few partners. A better way is to have several partners and even associates involved in the assessment activities and all members involved in the development of goals and an action plan. If the practice group is very large (more than 20 lawyers) you likely will need to operate with sub-specialties. The planning process can be broken into smaller groups and then brought together at the end. In order for your plan to be effectively executed, all practice group members will have to feel invested, take ownership and be assigned responsibilities, and then held accountable for the completion of tasks. Practice groups should meet on a regular basis, at least monthly, with a structured agenda, to review progress against the plan, and to update it with any new opportunities. Some groups find it easier to keep a running Action List that is updated after every meeting rather than keeping the original plan updated every month but it is important to use the goals as the primary agenda items for each meeting. Ideally, all practice groups in a firm follow the same model of pre-plan assessment and a template for their actual plans. This allows practice group leaders and firm management to share others’ plans, regularly monitor progress against goals and easily identify areas for synergy or opportunity. Our next post will address the Practice Group Leader as Financial Steward.